I’ve often wondered why yellow cake with chocolate frosting is no longer as popular as it was in my childhood. 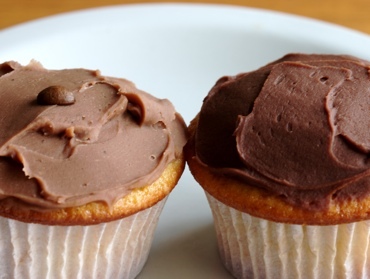 I love the contrast between a simply flavored (vanilla) sponge and a rich frosting of chocolate or coffee. But when I’m at a bakery, grocery store or restaurant, what I usually see is chocolate cake in all its variations —as long as you like chocolate with chocolate, occasionally with a fruity accent. Chocolate sponges or dense chocolate tortes just don’t excite me: The lusciousness of Theobroma often becomes dull bitterness, or heavy dullness. Chocolate in a softer form such as a mousse, soufflé, drink, or a truffled delicacy holds my attention with more success. As does a good frosting. Mocha frosted on the left, with coffee bean; choco-frosted on the right. Lyndon’s frosting is more like a soft ganache in texture, somewhat firmer compared with buttercream frosting. However, you can make it softer by adding more cream after blending in the confectioner’s sugar. I fiddled a bit with the recipe, though, and also made a mocha version. This variation makes a generous amount for a dozen cupcakes, or a single layer (8 or 9 inch) of cake —about 1 1/4 to 1 1/2 cups. Update (12-March-2008). Added info below for using liquor flavorings. Great for lovers of Grand Marnier, Royal Chambord, rum, etc. 3 ounces of semisweet or bittersweet chocolate, with at least 60% cocoa content; Guittard’s is just swell here. 1/2 cup heavy whipping cream, or crème fraîche; add more for a softer frosting. 2 to 3 tablespoons coffee beans, roughly chopped as seen here. You can also add 2 to 3 tablespoons of your favorite liqueur. For example, 2 1/2 tablespoons of Grand Marnier was just poifek, strong yet still chocolately. If you do this, don’t use more than 1/2 cup of cream initially, or the frosting might get too liquidy. If you do want it thinner, though, whisk in additional cream after adding the liqueur. If you’re making the mocha flavor, heat the cream until scalding and stir in the coffee beans. Steep for about 5 to 10 minutes, then proceed with step 2. Place the cream (or coffee cream mixture), butter, chocolate and salt in a small saucepan. Stir over medium heat until the butter and chocolate have melted; remove from heat. If making the mocha frosting, filter out the coffee beans with a fine-meshed strainer. Ultra-sekrit cheating: Place the chocolate, butter and cream into a microwave-proof bowl, and zap in 30 to 20 second bursts, stirring and whisking in between. Keep an eye on it to avoid scorching or bubbling over (which also applies to the stovetop method). Put the sifted confectioner’s sugar in a food processor with the (plastic) blade attachment. Pour in the chocolate (or mocha) mixture, and whirl until smooth. At this point the frosting will look more like a shiny sauce rather than a frosting, but that’s okay. Scrape around the sides and corners to loosen any unmixed sugar powder, and whirl again. Add more cream or liquor flavorings, if you wish. Whirl again until smooth. Scoop into a bowl and chill in refrigerator until not-to-thin, just-thick-enough to spread, about 15 minutes. You should give it a stir, at which point the frosting will have a lovely semi-matte silky texture. Apply with knife to cake substrate. Leftovers can be refrigerated or frozen. If frozen, defrost at room temperature, or overnight in the ‘fridge. To further soften, place over a pot of boiling water and stir and whisk into desired consistency. Or if you’re lazy like me, zap in 10 second intervals until just soft, then whisk into shape. This was written by sairuh. Posted on Tuesday, January 8, 2008, at 1:29 pm. Filed under Food. Tagged cake, chocolate, coffee, frosting, recipe. Bookmark the permalink. Follow comments here with the RSS feed. Post a comment or leave a trackback.